If you were a solo practitioner, you may have started out with no one to delegate to and so the fact that you had to make a delegation decision was clearer. You never have to delegate, but refusing to delegate tasks that do not require your unique skills and talent stunts your professional growth. Even so, there is some level of risk in every delegation. 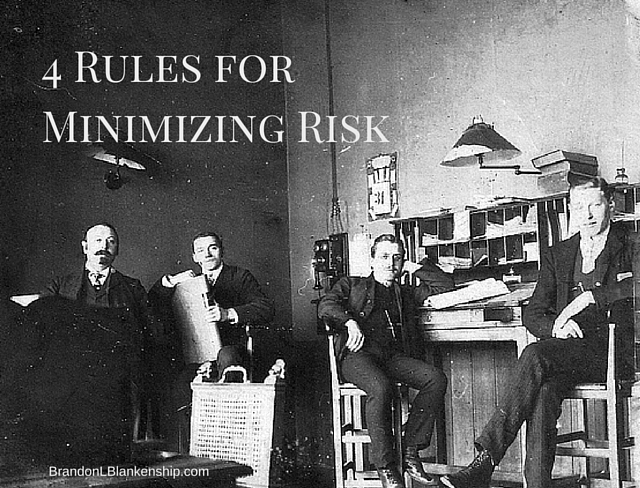 Here are four rules for minimizing this risk for lawyers. There is some level of comfort in delegating to lawyers because you might think, “they will never do anything to put their license at risk.” Or, you may think that an associate will certainly do quality work because they are building a reputation and they want it to be a good one. Rule #1: Don’t expect people to act in their own best interest. It is true that most people who worked to complete law school and get admitted to practice will do what you would expect – work to build a good reputation and stay well within the professional rules. The challenge is that the people who won’t act in their own best interest aren’t required to wear a big orange ring with a capital “W” on it for “Warning.” They look like everyone else. Establish check-in dates so you can monitor progress. When possible, monitor objective sources. Do not confuse delegation with abdication. Without check-ins, without reporting, you have abdicated. Abdication puts your life, at least your professional life in the hands of someone else. Is that ever a good plan? No. Non-lawyer delegees pose an added burden. 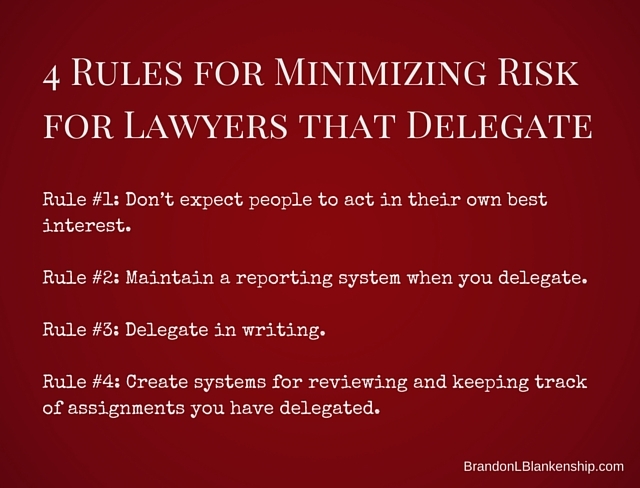 Most states have adopted Model Rule 5.3 in some form which requires that non-lawyer delegees not simply complete a task, but “…ensure that the [delegee]’s conduct is compatible with the professional obligations of the lawyer….”3 With such a heavy burden, strongly consider following Rule #3: Delegate in writing. Communicate your requirements clearly with understandable expectations and deadlines. Your instructions should include a description of your desired end product, time estimates and the context of the matter to help the delegee exhibit initiative in carrying out the assignment. Attorneys that delegate should provide the necessary resources including samples, precedents, citations and other people that can help delegees get the job done right. Writing out each delegation may seem like a lot of work, but it serves three purposes. One, it gives you an opportunity to consider what ethical implications the delegation may have. You may bark out an order thinking that the person receiving the order will not just do it but will do it the right way – like you would. But a non-lawyer delegee is not you and they are at risk of violating a rule that they are not even aware of. Written delegation instructions give you the opportunity to communicate how to do it right. Two, written instructions clearly communicate your expectations. Three, in the event that your intentions are ever questioned in an inquiry by a regulatory agency or your client, the contemporaneous written delegation is powerful evidence. Delegees usually don’t want to be seen as a failure. If for no other reason, they want to keep their job. Also, as delegees faithfully complete tasks you have assigned them, they earn trust. Once trust is established, it is easy to start taking the delegees word that a task is completed properly rather than make an independent verification. Tasks that are halfway completed or done wrong often reveal themselves pretty quickly, but what about the task that is omitted all together? Often the fact that a task is omitted does not reveal itself until the damage is great. Rule #4: Create systems for reviewing and keeping track of assignments you have delegated. 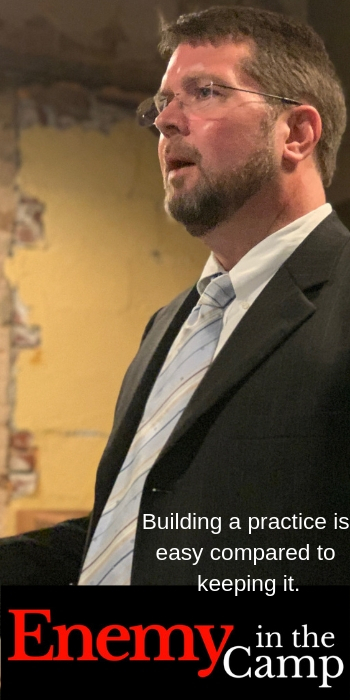 I knew one attorney that had one whole wall of his office converted into a whiteboard so that he could track the progress of work he had delegated. Another attorney showed me special shelves he had built so that his files could be displayed facing outward. Deadlines and delegated tasks were written on the face of each file. Many attorneys use software or apps to track the progress of delegated work. The best system isn’t necessarily the one with the most bells and whistles – it is the one you use. There are tons of free resources available on how to make delegation itself work, read a book, take an online course. You can become a master at delegation. Remember, however, that when you delegate as an attorney, it is not enough to simply get it done. It has to be done the right way, at the right time, for the right reason.